Projects that protect the climate can also boost well-being, equity, or resilience. But for groups of stakeholders with limited time and many complex goals and constraints it can be challenging to design for these benefits. We’ve created the FLOWER framework to make that process easier. 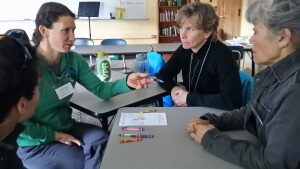 Coleen O’Connell, an instructor with Lesley University’s Ecological Teaching and Learning Program, has been using the FLOWER diagram at environmental workshops across New England. T he teachers at these workshops love having a framework with which to discuss multiple benefits and equity. They are also enthusiastic about the way that FLOWER can broaden people’s sense of what acting on climate looks like, and that it gives opportunities to engage others even if climate change isn’t their primary focus. She is reaching 75 educators with FLOWER, many of whom will use it in turn in their own classrooms. Nirmala Nair with the School of Practical Sustainability is working as a climate change consultant for Bhutan’s National Adaptation Program for Action (NAPA II). Her work is focused on bringing an integrative perspective to preparing Bhutan for the consequences of climate change. She uses FLOWER in her work with Bhutanese villagers and smallholder farmers, assisting them to change farming methods and use erosion control, local water harvesting, and other climate-smart practices. 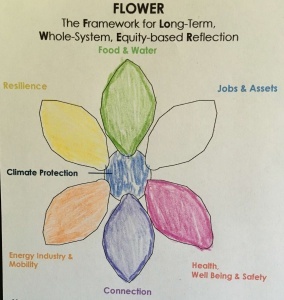 A group of community leaders in Atlanta, led by Climate Interactive and the Partnership for Southern Equity, used FLOWER at a workshop to compare potential green infrastructure investments and projects in terms of their co-benefits and what they wanted for their community. Interested in creating your own FLOWER diagram? Learn more and access the tool.